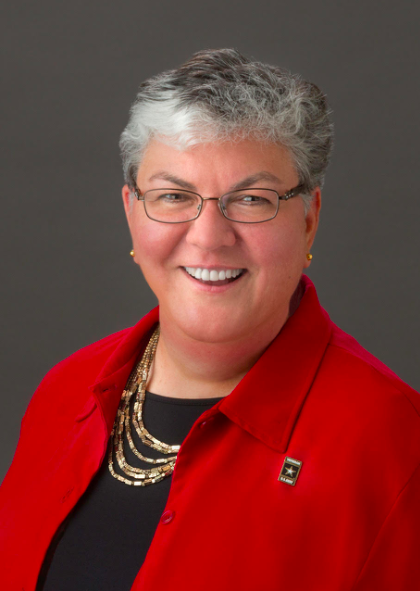 WASHINGTON, DC, Oct. 11, 2018 –Brenda “Sue” Fulton, a United States Military Academy graduate and longtime advocate for LGBTQ rights, is the recipient of the 2018 HOOAH award to be presented Oct. 17 at the 2018 Annual Conference on Citizenship. The HOOAH award is presented annually by the National Conference on Citizenship (NCoC)to recognize distinguished former service members who empower the next generation of military veterans to continue to serve beyond their time in uniform. “Hooah” refers to the U.S. Army battle cry used by soldiers and airmen. Fulton is a 1980 West Point graduate, a member of the first class of the USMA to admit women. Fulton was honorably discharged at the rank of Captainbefore becoming an integral founding member and leader in advocacy groups instrumental in overturning the U.S. military’s “Don’t Ask Don’t Tell” policy and ban on transgender service members. Fulton is currently the Chair and Chief Administrator of the New Jersey Motor Vehicle Commission, making her the first openly gay member of a New Jersey state cabinet. Previous HOOAH recipients include U.S. Rep. Tulsi Gabbard of Hawaii and retired Army Gen. Stanley McChrystal, former commander of international forces in Afghanistan. “Sue Fulton is a trailblazer who throughout her career has demonstrated remarkable leadership and persistence in efforts to expand the opportunities for military service for women and for members of the LGBT community,” said Sterling Speirn, chief executive officer for the National Conference on Citizenship.“Her public service includes work with two U.S. Presidents, the U.S. Military Academy at West Point, and now the Governor and people of New Jersey. This is matched by her pioneering efforts as a founder and leader for nonprofit organizations including Knights Out, OutServe and SPARTA. As part of NCoC’s ongoing efforts to support and promote the importance of service in all forms, the HOOAH award is presented at its annual conference. Fulton will receive the HOOAH award during the dinner program Oct. 17 at the 2018 Annual Conference on Citizenship. The theme of this year’s event is “It’s YOUR Democracy” and runs through Oct. 18 at the Marriott Marquis in Washington. To find more information about our conference, or to register, please visit our CONFERENCE WEBPAGE.